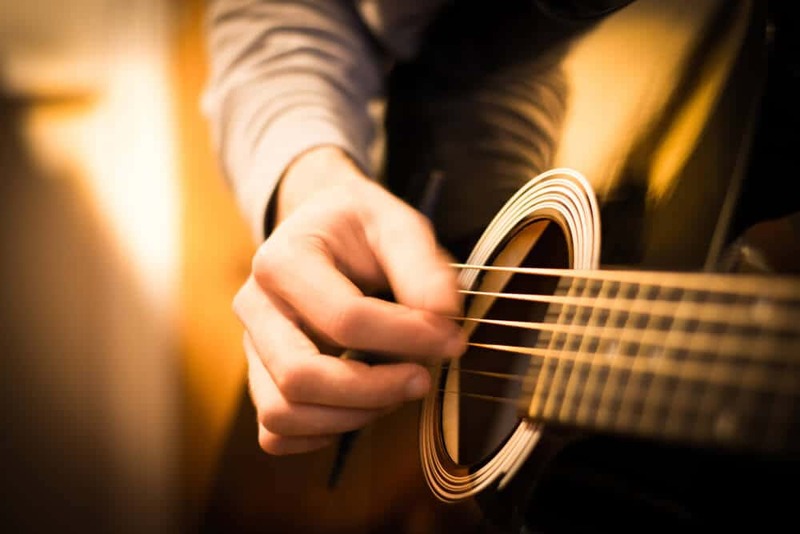 There are a number of guitar skills you already need to be comfortable with in order to be able to play acoustic or electric guitar at jam sessions with other musicians, here they are in no particular order. Playing at a jam is not about you. It's about the collective making music together. Even if you have amazing chops, you will mostly be playing rhythm guitar at any given jam session. All in all, about 80-90% of your playing will be rhythm guitar. Not because you can't play lead, but because that's one of the main roles of the guitarist in a band setup. And even if you don't play lead guitar, you can still attend a jam playing just rhythm guitar. How can you improve your rhythm guitar skills? First off, learn loads of grooves of all types in all genres. Funk guitar? Yes please. Funk is underrated, but a great funk guitar rhythm can really spice up a song. Blues guitar? Definitely. It has always been one of the most played genres at the jam sessions I've been at. Rock guitar? The more the better. If it's the later, you need to be comfortable with the concept of keys, and be able to identify the chords of any key. I would say the most used keys are A, C, D, E, G. Also, their relative keys are used often as well. You need to know the notes of each key (easy using scale shapes), and the chords of the keys. This requires a bit of theoretical knowledge, as you need to learn the theory of why each key has given chords. Once you know your keys and they chords in a key, you need to learn the specific chords. This requires knowledge of barre chords, so if you can't play barre chords yet, practice them first. So you basically need to learn all of the chords with all of the qualities all over the neck. This might seem hard, but it's actually not, if you use the CAGED system. By using CAGED, you can play several voicings of any chord all over the fretboard. Strumming at the same old chords will get boring for you, and the other's at the jam session. Use different voicings - Even the most repetitive strumming pattern can be spiced up by using different voicings of the same chord. Use the CAGED system to find alternate voicings of whichever chord you are playing. 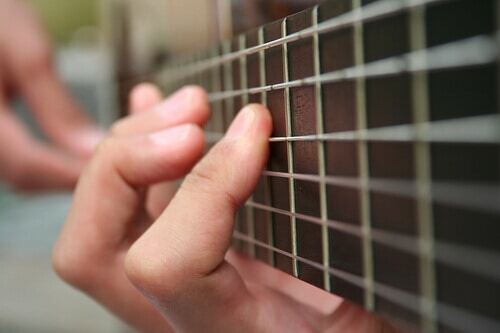 Slide into chords - Sliding into the next chord from 1 fret lower can do marvels. Add interesting groove variations - We already talked about this above. Learn chord embellishments - Small variations to your main chords that will make any old chord much more interesting. For example, adding the Dsus4 and Dsus2 while you're strumming at the D chord. Or adding the high E string 3rd fret to a C major. Small things like this will make any chord more interesting. Fill riffs - Practice riffs to add to your chords while strumming. So let's say you're in a 12 bar blues. You should be able to add small fill licks on the chord you are playing. And even call and response style riffs. While it's nice to spice up a chord here and there, you have to be careful not to take it overboard. Playing at a jam session is a group activity. You should only spice things up when it's OK to do so, not interfering with what other's are playing/singing at the given moment in time. When you're about to jam in a given key, you might also agree on a chord progression in the key. It's good to already know the most popular chord progression in all of the most commonly used keys, this will make things easier for you. Bonus tip: Learn short riffs to connect chord changes. So for example, staying with a 12 bar blues, lets say in E, learn walk up riffs from E to A, walk down from A to E, E to B, B to A. Naturally if you learn it in 1 key, you'll be able to use the same riffs in other keys. 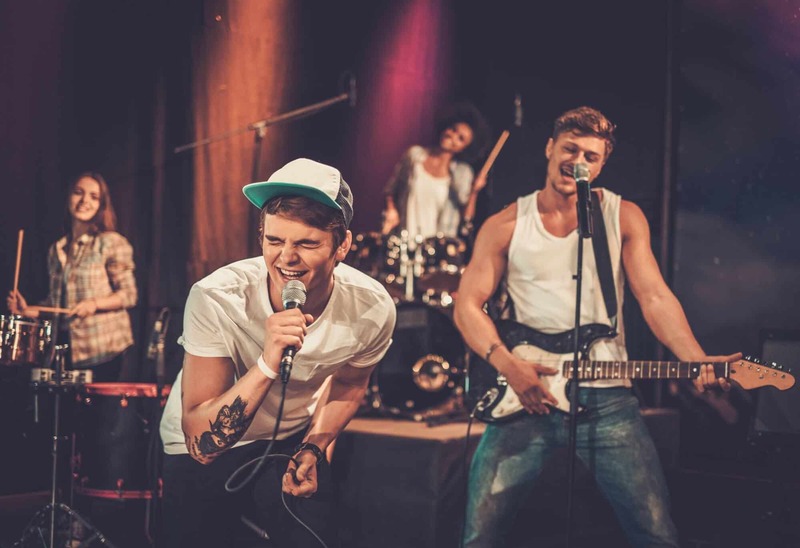 If you are up to it, you will get a chance to show off your lead guitar skills at a jam session. Be polite though, nobody likes to listen to a 2 minute improvised solo. Keep it short and sweet. The most important out of these is undoubtedly the minor pentatonic scale. Here is a thread on reddit with some great tips from a semi-pro guitarist/musician. Learn to listen - It's ok to start out slow and listen for the chords and chord progression. Team work - Remember that there is no "I" in "team". A jam session will be fun and productive if every member supports every other member. Volume and dynamics - Don't play too loud when you are playing rhythm guitar. Palm muting and volume control is key. No surprise chords/keys - Don't change into another key or add chords that are not in the key. That sounds bad and throws the others off. If you want to change keys, let the others know before hand. Rhythm guitar > lead guitar - Just to re-emphasize. 80% rhythm, 20% lead. Repeat the chord progression - Part of playing rhythm guitar is playing the same chord progression over and over again. There is nothing wrong with it, don't try to change things up when you don't need to. Good solos are like stories - All stories have a beginning, a middle and an end. When you play a solo, try to lead into it, have a nice strong mid section, and lead out of it gracefully. Learn loads of riffs - Using fill riffs in any key is always a nice way to spice things up. Here is a useful video with more tips on how to jam with other musicians. Most guitarists, who have never jammed with others before, are a bit afraid of the experience. If you are at an intermediate level of playing, you can take part in a jam session. At the minimum, you can play rhythm guitar. If you are prepared, you will do just fine. Look at the things I listed above, and practice at home using backing tracks. The outline of the things you should know to jam with others covers several topics. And they are big topics. Don't search YouTube for a video on each, as the things you'll find will leave lots of holes in your knowledge. A single video can't possibly cover every topic and provide practice opportunities. Check Jamplay (here is a coupon for Jamplay), Guitartricks (and a free trial link for Guitartricks) and Truefire for specialized courses on these topics, these are the best guitar lesson sites. They cost a few dollars, but they will actually help you learn the skills you need to start jamming with others.